In order to practice either of these methods of developing bodhicitta we must first develop a sense of equanimity towards all living beings. [See Lama Zopa Rinpoche’s Equilibrium Meditation.] We must transcend seeing some beings as close friends, others as disliked or hated enemies and the rest as merely unknown strangers. Until we have developed equanimity for all beings, any meditation we do in an attempt to develop bodhicitta will not be effective. For example, if we want to paint a mural on a wall we must first get rid of all the cracks and lumps on its surface. Similarly, we cannot create the beautiful bodhicitta within our mind until it has been purified of the distortions of seeing others as friend, enemy or stranger. 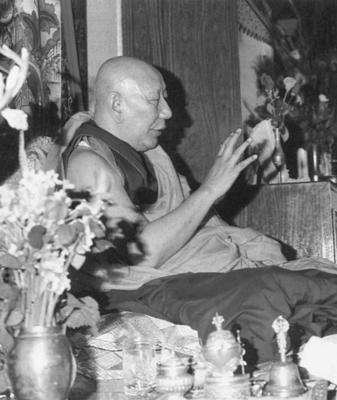 This teaching was given at Tushita Mahayana Meditation Centre on November 14, 1979. Edited by Nicholas Ribush from an oral translation by Lama Gelek Rinpoche. First published in Teachings at Tushita, edited by Nicholas Ribush with Glenn H. Mullin, Mahayana Publications, New Delhi, 1981.